If my dedicated followers have been thinking why I have not posted any new salad recipes then its just because some of the ingredients are really difficult to get in Mombasa. The rains in Kenya have destroyed a lot of crops. The carrots available at the moment are really fresh, crunchy and sweet. Usually, carrot salad is pretty boring with just a few raisins added to it along with some sort of dressing. Carrot salad doesn’t have to be boring any more. This recipe promises to be crunchy, tangy and delectable. Add some lemon juice onto the apple slices so that they do not turn brown. Mix the carrots, nuts, mint and apple in a serving bowl. Whisk the vinegar, oil, honey or maple syrup, salt and pepper together. Can add any nuts you prefer. Can use mayonnaise as a dressing if you like. Try basil instead of mint. use any type of apple. I love the sour taste of the green apples. 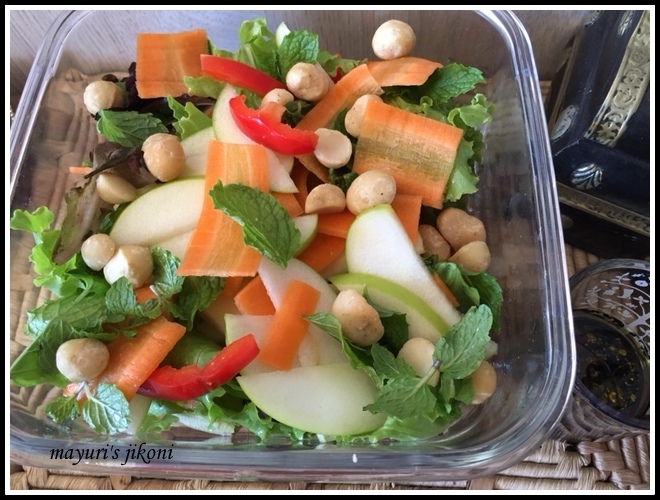 I love apple and carrot together for a nice crunchy salad.